20 (22, 24)" circumference, buttoned. Hat shown measures 20". 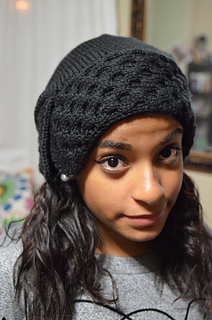 -Finished Size: 20 (22, 24)“ circumference, buttoned. Hat shown measures 20”. -Yarn: Plymouth Yarn Galway Worsted (100% pure wool; 210 yd 192 m/3 1/2 oz 100 g): #179 lemon zest, 1 (2, 2) ball(s). -Needles: Ribbing—size 5 (3.75 mm): straights. 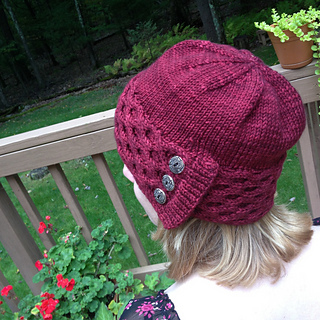 Brim and body—size 7 (4.5 mm): 16” circular (cir) and set of double-pointed (dpn). Adjust needle size if neces¬sary to obtain the correct gauge. -Notions: Markers (m); cable needle (cn); tapestry needle; three 3/4” buttons. -Gauge: 20 sts and 24 rows = 4” in St st on larger needles; 28 sts = 3 3/4” and 32 rows = 4” in Honeycomb patt on larger needles. 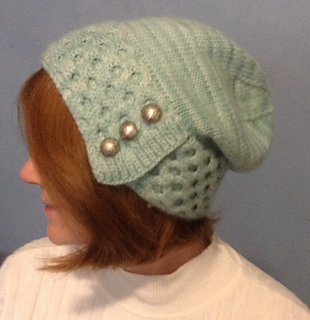 This cozy women’s slouch features a honeycomb pattern brim that is worked flat and then joined in the round, using buttons and buttonholes, to complete the body.